On the surface of Mars, the three Cumberland Ridge outcrops: a) Larry's Lookout, b) Jibsheet and c) Methuselah. Their progressively different terrain and levels of iron oxidation suggest they were affected by acidic fog. Acid fog may once have eaten away rocks on Mars, researchers say. 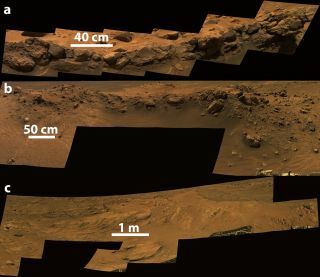 Scientists concentrated on data that the Spirit rover gathered from exposed bedrock at the Columbia Hills of Gusev Crater near the equator of Mars. Spirit analyzed a dozen locations on four outcrops of rocks spanning about 650 feet (200 meters) along Cumberland Ridge and the Husband Hill summit. These rocks also varied when it came to the sizes of the knobby bumps on them, as well as how much the iron in the rocks was oxidized. These variations in structure, bumps and iron may all stem from the same cause — acid fog. "What we saw on Mars was the result of volcanic eruptions that happened billions of years ago, probably before there was multicellular life on Earth," study co-author Shoshanna Cole, a planetary scientist at Ithaca College in New York, told Space.com.The researchers suggest these rocks were exposed to acidic water vapor from volcanic eruptions. This corrosive fog may have been similar to the caustic volcanic smog, or "vog," spewed from the eruptions of Kilauea in Hawaii. This false-color mosaic of Cumberland Ridge on the Martian surface covers a space about 1/3 the size of a football field. Its labeled regions show dramatically varying iron-bearing mineralogy. When Martian vog drifted onto the surface of the rocks that Spirit analyzed, the acid fog would have made them lose their crystalline structure and dissolved some of the minerals, forming a gel. The water in the vog then evaporated, cementing grains of the rock together into bumps. Similar effects were seen in previous experiments that exposed volcanic rocks similar to those on Mars to sulfuric and hydrochloric acids. "So nothing is being added or taken away, but it was changed," Cole said in a statement. "This would have happened in tiny amounts over a very long time. There's even one place where you see the cementing agent healing a fracture. It's pretty awesome. I was pretty happy when I found that one." The variations seen in these changes may be due to variations in the area's terrain. For instance, the amount of sunshine and wind each rock received would influence the amount of gel the vog formed on it. The more-altered rocks with the larger bumps are on very steep slopes facing away from the sun, which made them shadier, while the least-altered rocks are on sunnier and gentler slopes, the investigators said. "In the same way that your home garden will have little microclimates, with some places warmer or cooler than others, and plants growing better in one spot than another, there were microclimates on Mars," Cole said. Future research can model this site in great detail "to see how much erosion might have happened," Cole said. Cole and her colleagues detailed their findings Nov. 2 at the annual meeting of the Geological Society. of America in Baltimore.